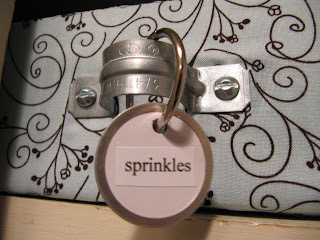 Sew Many Ways...: Organize Your Life...One Spot At A Time! Organize Your Life...One Spot At A Time! Spring is coming...I hope...soon, I'm freezing! What does spring mean: spring cleaning, purging, organizing etc. On a whole, it can be a daunting task. The best solution is to take it on...one small project at a time and to do it on a budget is even better. 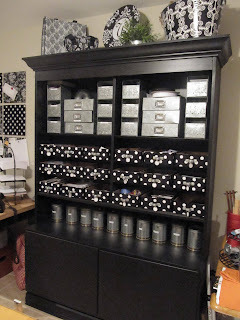 You've seen this picture of the cabinet in my sewing room before. 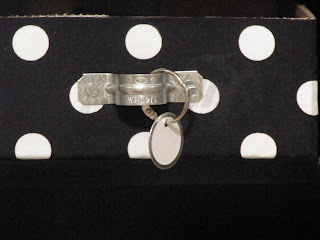 Those little black and white polka dot boxes are storage bins for all sorts of crafting supplies. I have since made more and covered them in a different fabric. Remember those are pipe straps from the hardware store for the handles...cheap, cheap! Our 2 daughters drink a lot of bottled water, so I save every single box the water comes in. What did I do with all the blue boxes? Well, you know that small narrow cabinet that some of us have in the kitchen...they fit perfectly in there. That cabinet has held so many things, but all the little stuff gets lost in the back. This is now my spice cabinet, with a box for each category. All the little jars and bottles fit in the box and it's easy to pull out the box rather than dig through the shelf looking for what I need. I had extra boxes for another cabinet too. I also use canning jars with the one piece lids. 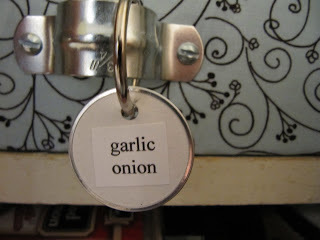 I started using these when that little stinker of a mouse invaded the cabinet and ate all my chocolate chips! The boxes hold all those little items that can get lost in the shuffle. 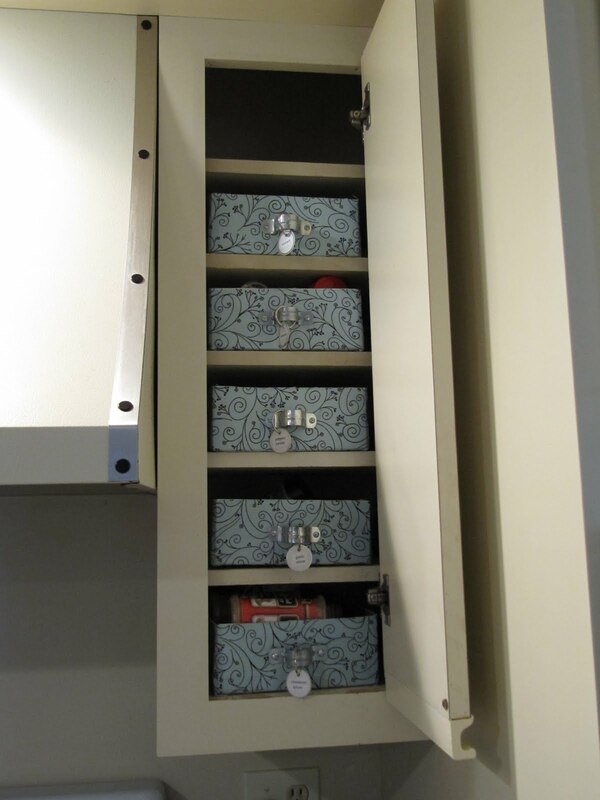 adjust your shelves to make the most of all the space in the cabinet too. maybe set aside a little time on one day a week, so you can get through the task faster. Remember ONE PROJECT AT A TIME and you won't be over whelmed. I'm hoping to do one post a week to help with organizing...tips and tricks! The boxes look great. So creative and useful. Where did you find those lids for the canning jars? What a great idea! How do you get the fabric to stick to the boxes? 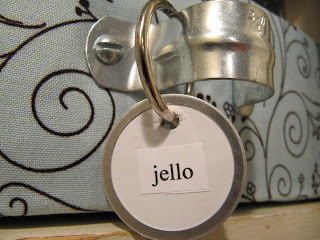 Do you use staples or glue/mod podge? She wrote it above when she was talking about the first time she covered them. 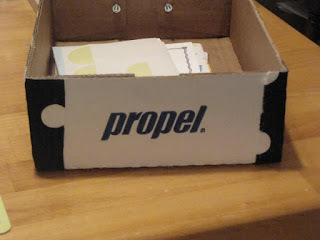 Here's her words how she got the fabric to stick to the boxes; "I used spray glue to adhere the fabric to the box, but then added a bead of hot glue to the edges, because the spray glue to hold as well"
Karen, this is one GREAT post. At our house we make coffee using Kerurig K-cups I've found that we use A LOT OF THEM. So many boxes - - - - All the same size. I've covered them and use them to hold my GO! cut quilt pieces - each box labeled. 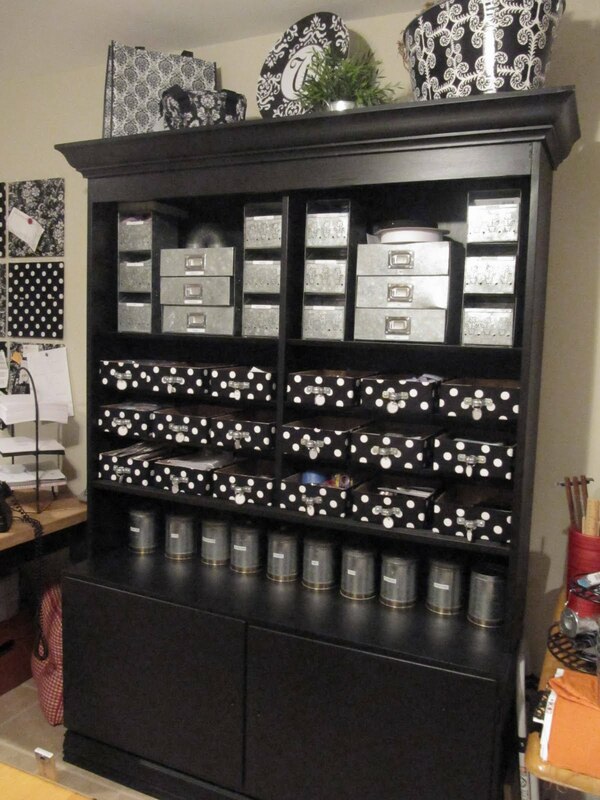 Wow you are an Organizing Queen... i am so jealous! Very cool. Inspiring. and oh my goodness I wish I had your get-up-and-go!! :) Thanks for sharing!! Could you come to my house and "play"? It would be fun!! What a beautiful way to organize. You are truly inspiring!! Great idea. Wonderful way to organize. That looks so nice! I can't believe they're cardboard boxes!!! You have such great ideas! I also wanted to thank you for your post about having email addresses available from comment posts...I just couldn't figure that out and I knew I was guilty. What a great way to organize. I will follow your example. How timely. This post has got me thinking I won't just tidy up, I'm gonna smarten up! Such a creative use for boxes. Love them. Love the spots. I just love the fabric covered boxes! 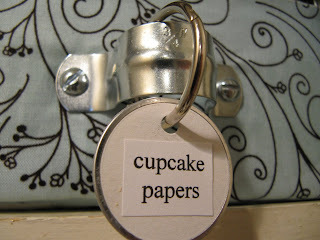 They go along so well with the ideas about which I'm reading in "Organizing From the Inside Out"! Thanks for sharing & inspiring! I look at your wonderful home and think that my home could never look like that, you are amazing. An old neighbor who works for a large spice/herb company sent me a box filled with bottles and bottles of herbs/spices for Christmas. 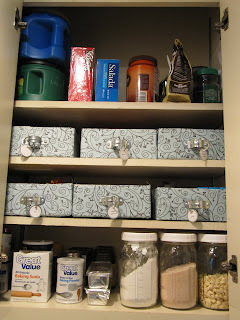 I tried the old lazy susan for the bottles in that before mentioned skinny cabinet but still can't find a darned thing. I love the idea of the boxes. I've been purging the cabinets, closets and drawers (it's an ongoing thing I kind of enjoy) but now I see boxes in my future. What a great idea. Organize? The pics are lovely but the word doesn't translate in my world. Sigh. What a wonderful idea to get organized before getting organized! I am usually the one trying to find the boxes I need after I have pulled everything out of a cupboard. I also love the idea of using what you have rather than purchasing! (Thinking I may have just put all of those dang Girl Scout cookie boxes to good use!) And the pipe strap as handle, pure genius. 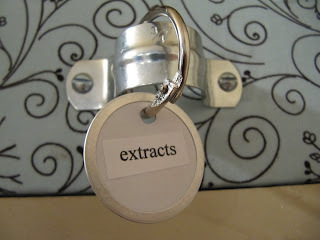 I am a huge fan of those little white paper tags too. I use them on everything. You are quickly becoming my newest, favoritest blog! 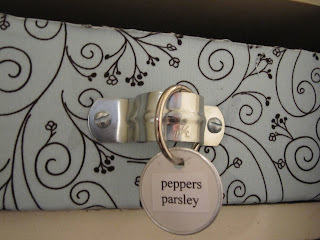 What a fabulous idea, so much better than buying boxes to organize - that is always when it costs so much. I am going to start saving our boxes. Thanks for sharing! I envy your organisation! I think my craft room organisation is as conquered as the space allows. I'm trying to get my lounge room organised little by little now. Thanks so much for sharing! Thank you, Karen, for another interesting and inspiring post. I gotta tell you, though: The best advice you gave was ONE PROJECT AT A TIME. Sooooo many times I get going on one thing and then a sparkly chicken runs through the room and I'm off to do something else. And of course, nothing gets done and there's more of a mess than when I started! What a great way of organizing things! Thanks from sharing, your post was very inspiring! I'm visiting from "Under the Table and Dreaming. Those pipe strap handles are amazing! Thanks for sharing! I love your boxes, Karen! They're beautiful. 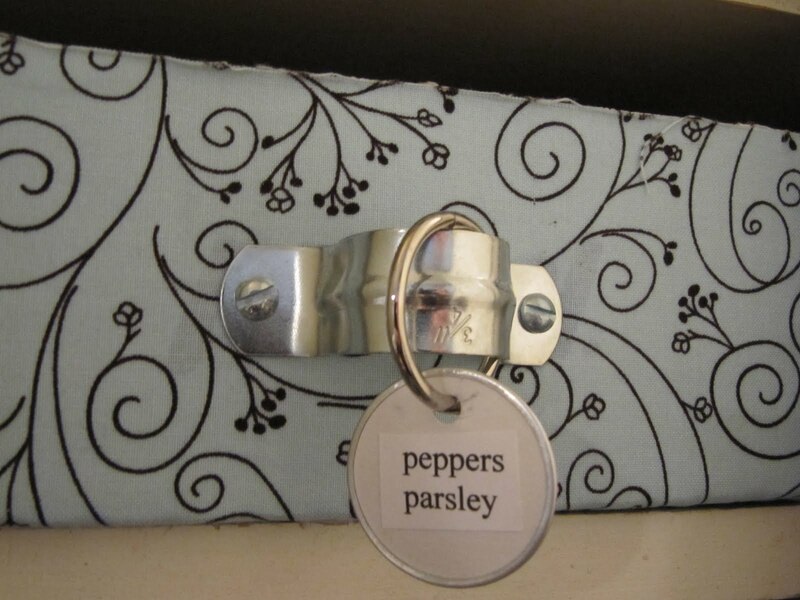 The pipe strap handles and little circle tags are unbelievably clever. Genius! Looking forward to more organizing posts. vá me conhecer também, será recebida com muito carinhos. Love the boxes. Would love to see what they look like inside. 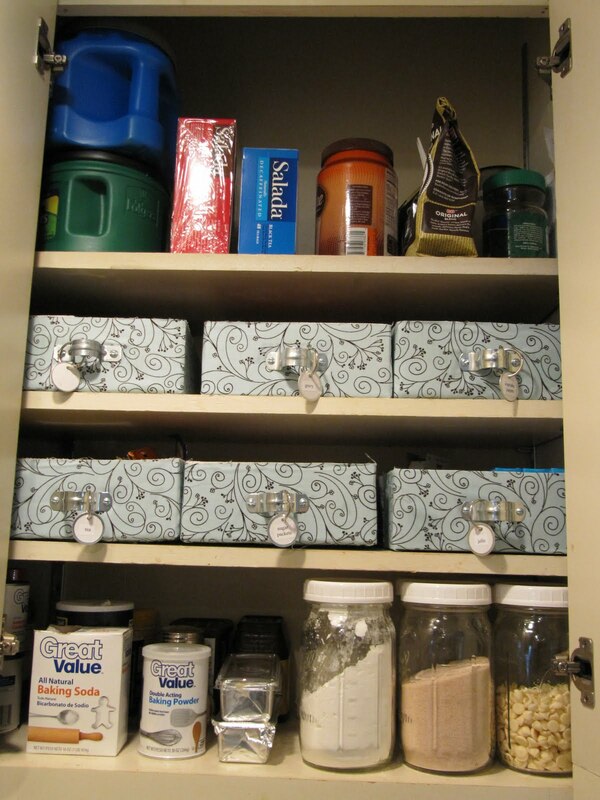 Great organizing ideas. 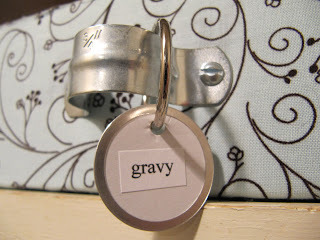 I would love to know where you get the little round paper tags for labeling. I have looked at Michaels and Hobby Lobby and have struck out both times. Should I look at an office supply store? Hardware store? Or do you have an online source? Thanks so much! Love the look! I have done something similar but with clear containers so I can see when supplies are getting low. You gave me an idea. I've already started doing little boxes, but not all made. 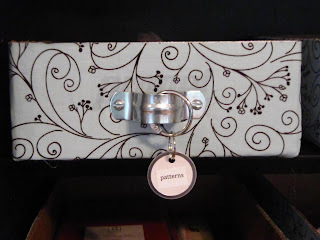 I chose a contact paper for a bookshelf that I'm doing and I like to keep a lot of boxes - just in case. 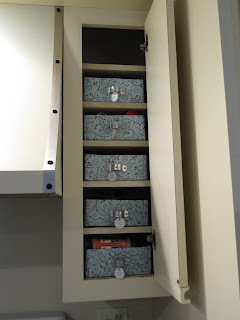 I'll use boxes to pack things in or mail, now the shoe boxes that may go to waste will look extra cute in my home office that I'm redoing into a sitting room. 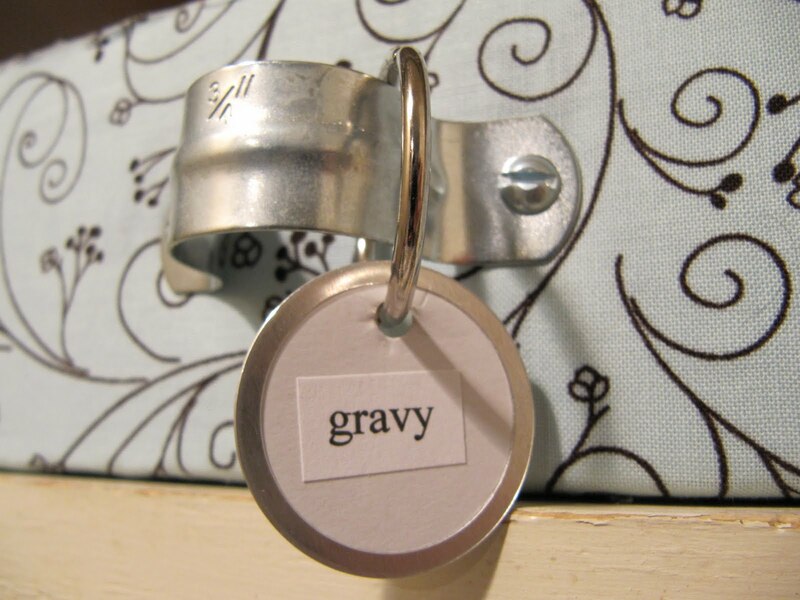 I think I'll use that idea in each room when I need a little sprucing and organizing. Thanks for the inspiration. I just stumbled across your blog by following a picture on pinterest. 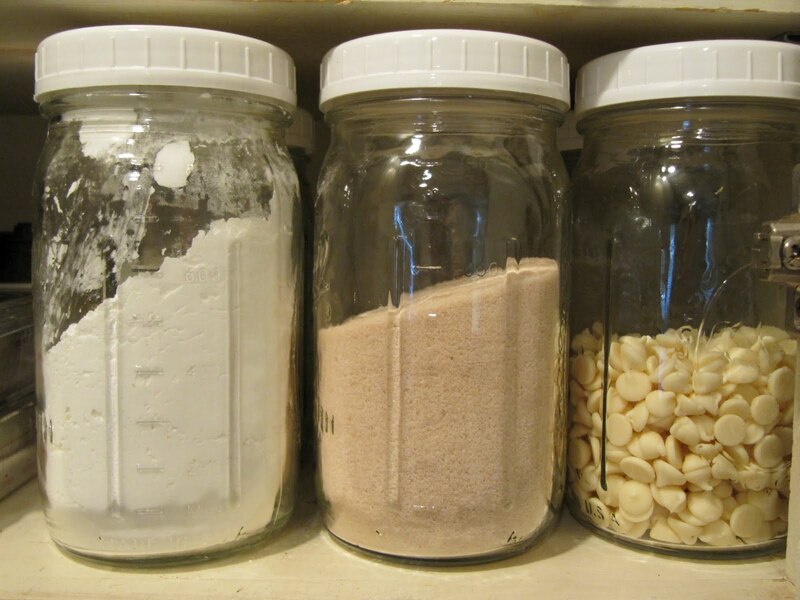 I noticed that you have some dry goods (like spices) in those canning containers. 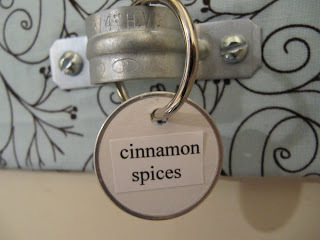 I was wondering if this keeps the spices from getting hard, or is the seal not that great. Thanks.